Who is Theodore Us? : I actually played a game! I actually played a game! 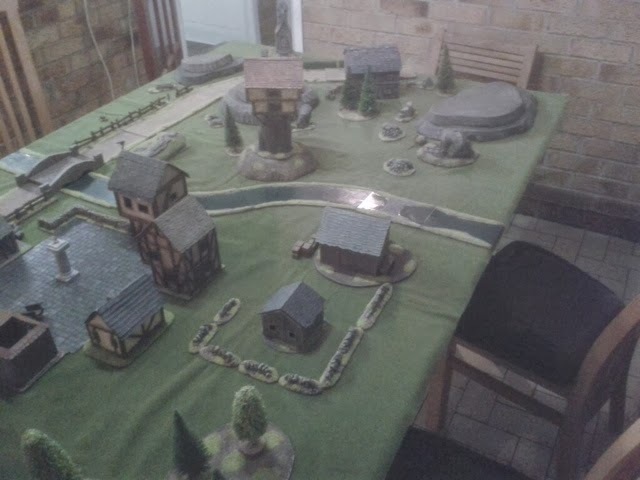 Josh and I finally managed to get together for a game of LOTR/ Hobbit! 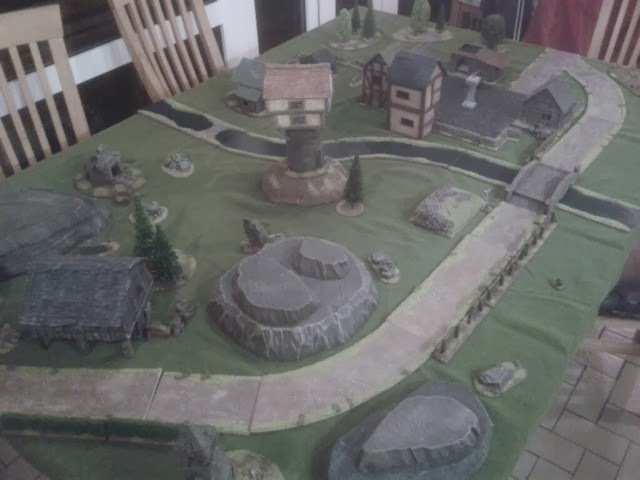 We played 1500 points fighting out over a mining town in the misty mountains. 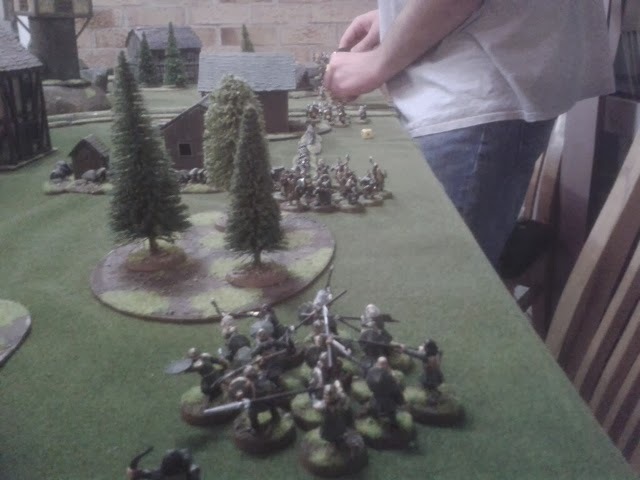 Josh brought his dwarves and I fielded an alliance of goblins and hunter orcs led by Bolg, with the three trolls along for the LOLs. We determined objectives by dice roll, with three common objectives and one each that was secret to the other. 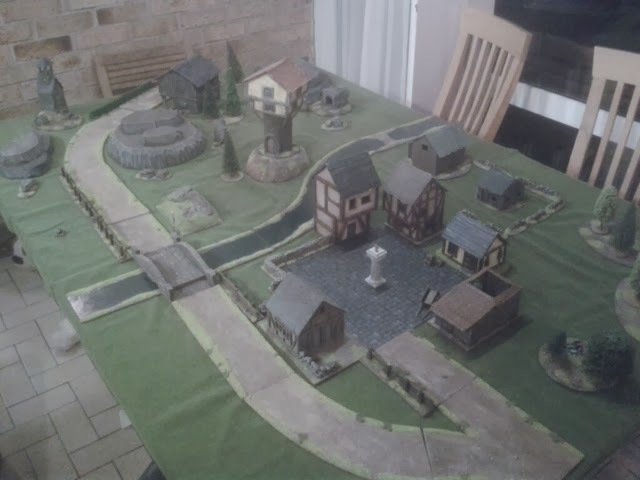 The common objectives were a victory point for the first kill, 1 for holding the large she'd by the road and 3 for holding the tower in the middle of the board. My secret one was to capture the treasure chest in the village square. Dwarves got priority the first two turns and advanced at "full speed". The evil alliance also charged forward, and the Scribe managed to summon 6 more goblins in the first turn. Josh wised up to this and in the second turn "turned off" the Scribe's ability. Turn 3 saw the dwarves pick off two hunter orcs picked off to bow fire. 1 point to the dwarves! The goblin shooting was typical and therefore all missed or failed to wound! Turn four and Floi again disabled the scribe. The goblin hoard advances on the treasure (top right, behind the cart). I lost track of turns at this point. Suffice to say that the dwarves continued to win priority. Dain called a heroic combat to rescue one of his captains. He then inflicted 3 wounds on the chieftain, one of which the chieftain saved with his fate roll. The dwarves then started to make off with the treasure. Were they after the gold too? Or are they just greedy? Or is that a silly question? Drar took out 2 Fell Wargs, and the spider queen rended a Khazad guard. At this point evil had taken 8 casualties to good's 3. Turn 5? 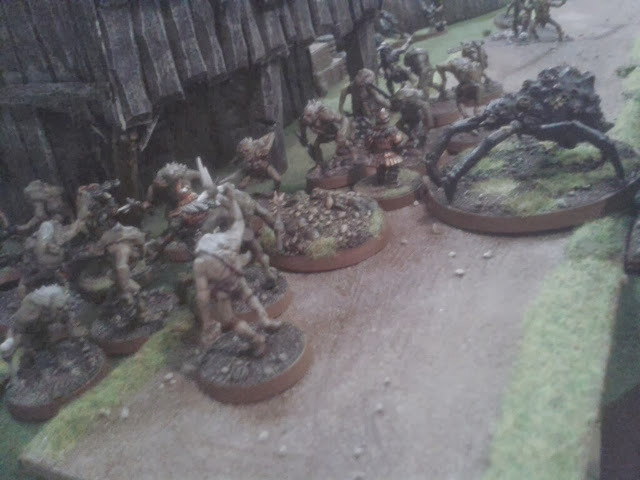 Spider queen called a heroic move and charged into the Khazad guard. The other fell Wargs cowered in the village away from Drar, warg's bane. 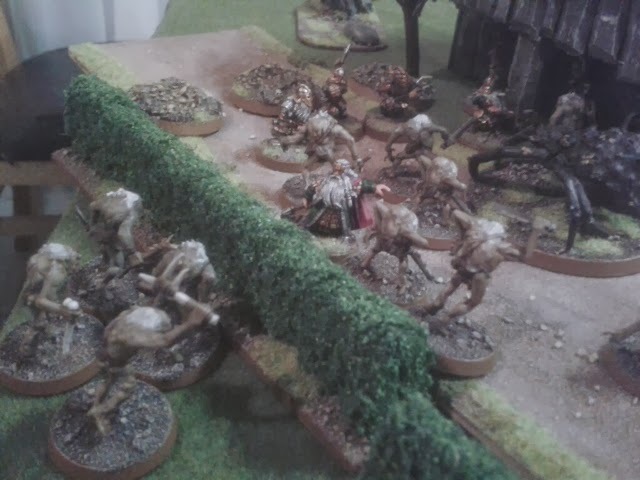 The scribe brought on 5 more goblins behind the dwarf line to try and distract the archers. A whole warband of dwarves ran away from Bolg. A hunter Orc managed to pick off an iron guard from bow fire. In combat the warg chieftain took a wound off a dwarf captain who failed his fate roll. In the square the cowardly dwarves shielded lots and own combats easily. By the shed 6 goblins teamed up on Balin and inflicted one wound on him, also burning his fate and a might. Turn 6 saw a few more casualties due to shooting. The dwarf captain got revenge and killed the limping warg chieftain. 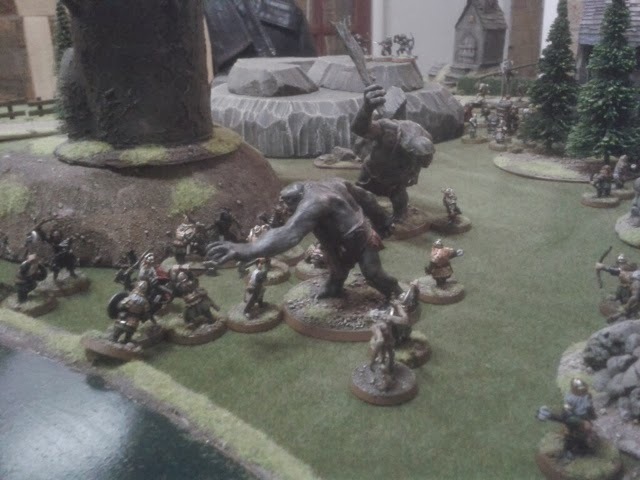 Bolg got into combat and bashed a dwarf into the ground, and Tom rended another one. Turn 7 was priority for evil at last. 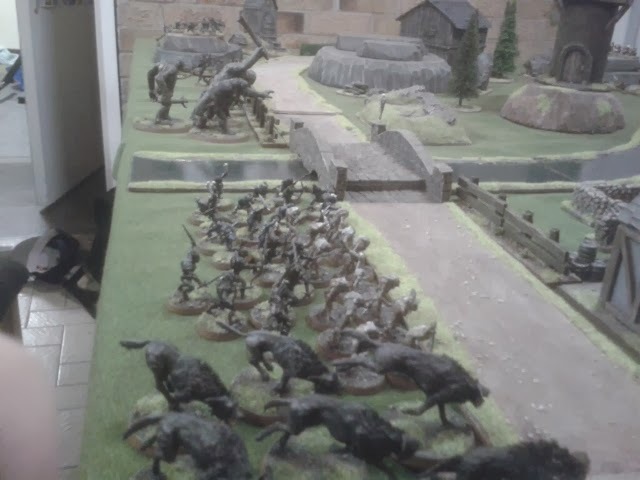 Bill lumbered into view of the dwarf archers who loosed a volley of arrows inflicting one wound. 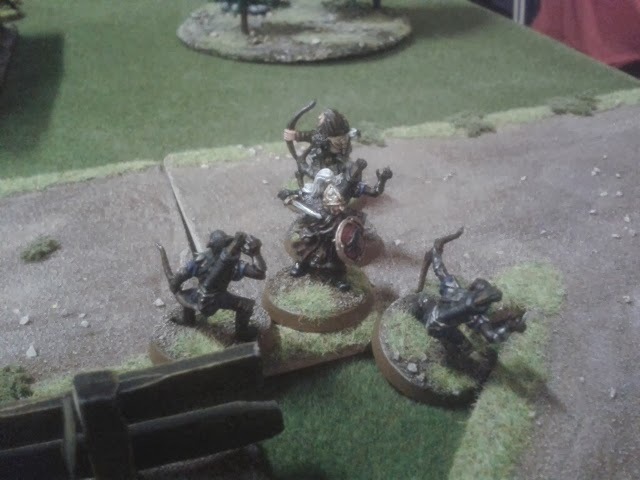 Five dwarves failed their courage checks to charge Tom in combat. A misty mountains goblin beat Dain in combat, Dain needed a fate roll to avoid being wounded! The spider queen chomped Balin up in combat. Bolg was surrounded and needed to use all three might to survive, he does now cause terror. 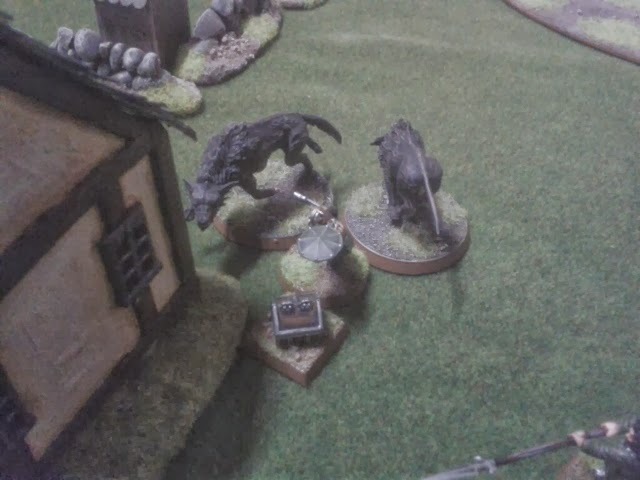 The flank by the shed was now collapsing for the dwarves, but they definitely had the upper hand in the square and had dragged off the treasure despite the best efforts of the warg pack. Turn 8. Good priority. Heroic move from Bill the troll caused havoc in the centre. Floi had regained a might so switched off the scribe again. One dwarf archer failed his courage check for the second time running against a troll. In the square the dwarf dominance continued. In the centre clever heroic strikes from the dwarf captains were burning off might from the trolls, but the flank by the shed had completely collapsed, the dwarves losing double figures in combat in total for that round. However, the dwarves had done enough and broken the evil army. Turn 9. Evil priority. Break tests aplenty, with a few cowardly scum running. 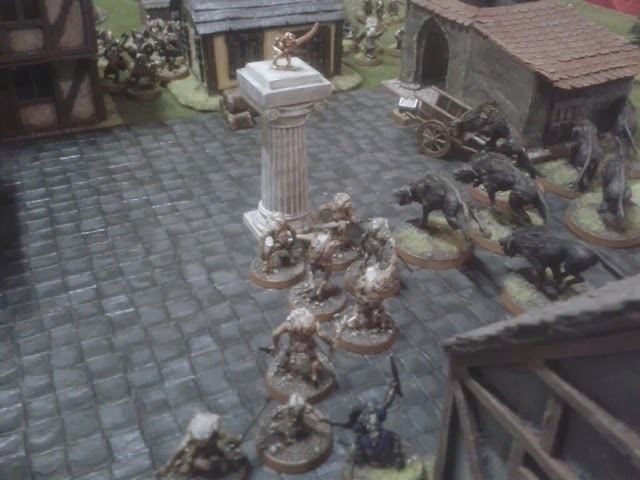 The orcs made a dash for the tower, and brought on reinforcements to try and capture the treasure. Drar shot the shaman in the square, no more fury saves. 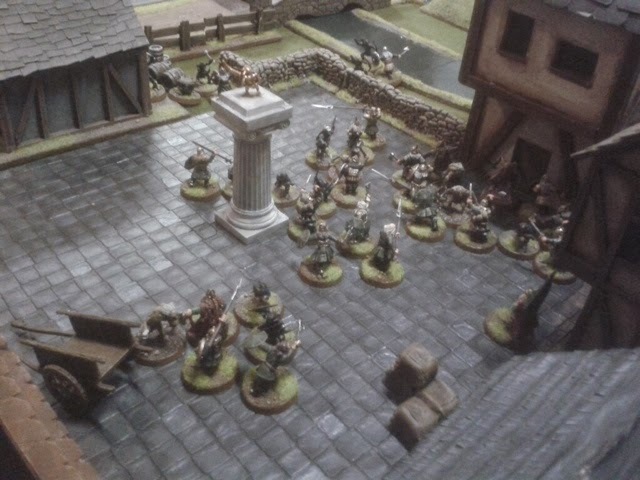 Bert lumbered into the square, lost combat but the dwarves failed to wound him. Dain dispatched yet more goblins. In the middle the trolls and Bolg failed to wound, lots of goblins died. Turn 10, only 5 more casualties needed to end the game. 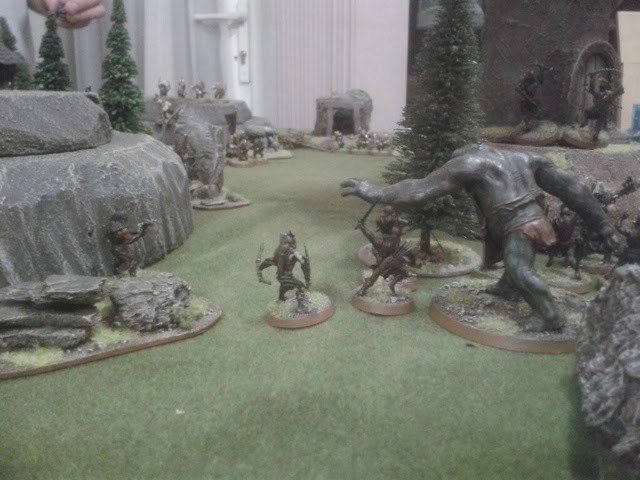 Tom the troll and Bolg pulled scary faces and the dwarves failed their courage checks to charge them. The dwarves charged for the shed, but it was too late for it was already swarming with goblins. Hunter orcs led by Narzug and Bolg held the tower. Gimli failed again to kill the goblins surrounding him. So despite being broken I had 6 victory points for holding the two objectives. I had failed to capture the treasure though. Josh had one point for the first kill, and revealed his mission to be one point for each quarter of the board controlled. Three were contested, and even if he won all four he couldn't have won so we didn't bother checking. It was close though and I'm not sure I deserved to win. I was impressed with my new units. The hunter orcs were good, and I need to see them more. The trolls were excellent. I do love rend! The best troops though were the misty mountains goblins and the scribe, totally unexpected. They won combat so many times and killed more than their fair share of dwarves. For the dwarves, Dain was a monster and the Iron guard are always a nuisance. Gimli was unspectacular, and Murin and Drar were hit and miss. Overall a fun game, hoping to get some more in soon. Wow, that board looks amazing! I'm actually jealous! Wood Elves finished + more!